I saw this over at Fuse, and didn't notice then that it was from you. My co-worker and I were really pleased with it. 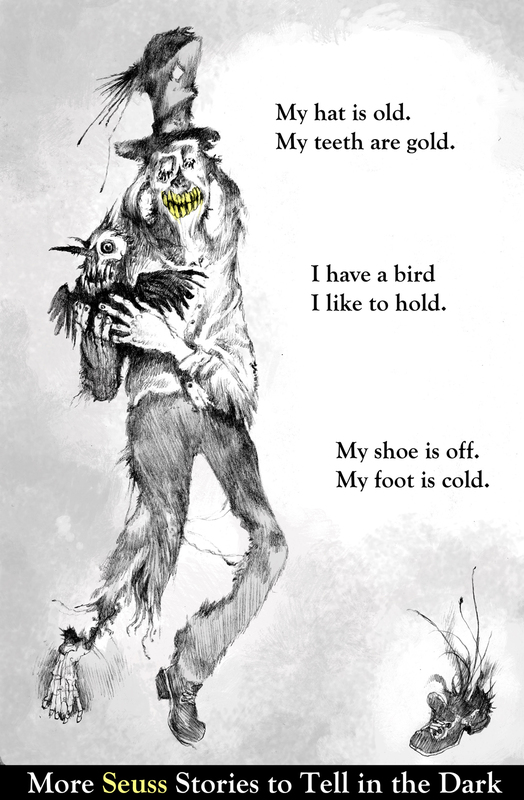 1f2frfbf is an amazingly strange book, even by Seuss standards, and we were glad at the way you had been able to bring that out. I also remarked on how nice it was that you had gone with the gold tooth guy instead of the much more obvious choice of Clark in the Park. There must be an H.P. Lovecraft mashup of Clark, but I don't think I've seen it. I thought about Clark. But the thing about Clark, is that rhyme is intentionally spooky. The spookiness of "My hat is old" is unintentional. That's amazing! I love Fuse, so I can't believe I hadn't noticed this entry before.